Most cars have poor rear-ward visibility for toddlers, and reversing cameras can dramatically improve the field of view. 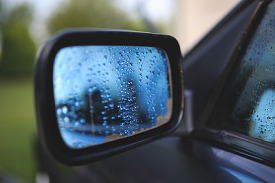 Remember they should be used along with the vehicle’s mirrors, and carefully checking around the vehicle, before reversing. Many new cars have reversing cameras installed, but if your car does not have a reversing camera, consider installation of one, especially if you have small children. Go to your local auto-electrical supplier and discuss the options best suited to your vehicle. When looking at purchasing a vehicle, the NRMA have reversibility and blind spot ratings for vehicles. On average, eight children every year across Australia die in a home driveway runover, and at least three children per week are injured. (Source: Kidsafe) In the majority of cases, the vehicle is reversing and is being driven by the victim’s parent or close friend of the family who is not aware the child has run behind the vehicle. Reverse Alert is activated when the driver selects reverse gear. This automatically switches on the unit and activates the sensors mounted on the rear of the vehicle. If the sensor detects an obstruction behind the vehicle an alarm sounds, alerting not only the driver but also anyone in the vicinity of the potential imminent danger. If the vehicle continues to reverse toward the obstruction, Reverse Alert automatically applies the vehicles brakes, stopping the vehicle. The system has been developed to be a superior alternative to existing reversing sensors and should be commercially available later this year. Working units have been installed on a variety of vehicles already, and the system is entering the final stage before it is officially launched. KidsAndCars.org are an American organisation who do similar work to Kidsafe here in Australia. Every day, children are left unattended in or around vehicles – a danger most people greatly underestimate. Hyperthermia, power window strangulations, and low-speed high severity crush injuries like backovers and frontovers typify what happens when children are left alone in or around motor vehicles on private property. KidsAndCars.org has worked diligently to document the dimensions of the problem through their unique data gathering techniques. KidsAndCars.org focuses attention to these tragedies with education and public awareness campaigns to this previously unrecognized public safety problem. Successfully passing state laws, proposing Federal policy change and working towards the redesign of motor vehicles to make them safer for children are of paramount important to reduce or eliminate these predictable and preventable causes of injury and death.